1 Who is Chris Jansing from MSNBC? 6 What is Chris Jansing’s Net Worth? 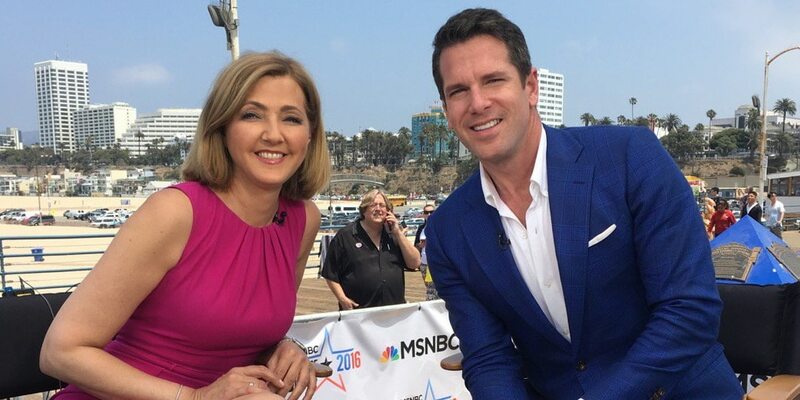 Who is Chris Jansing from MSNBC? Born Christine Ann ‘Chris’ Kapostasy-Jansing on the 30th of January 1957, in Fairport Harbor, Ohio USA, Chris Jansing is a 61-year-old Caucasian journalist and TV correspondent, of Hungarian and Slovak descent. She is perhaps best known for having a significant media presence as the senior national correspondent of NBC News’ cable division, following a number of jobs at several other media companies throughout her career. She has been active in the sometimes lucrative journalism business since 1980. Chris was raised in a family of 12 children, of whom she was the youngest. Her Roman Catholic parents are Joseph and Tilly Kapostasy, and they raised their children in a pious fashion. Unfortunately, there is virtually no information concerning her early youth, neither schooling, interests or hobbies, but she was apparently keen on obtaining a degree in political science. However, while she was studying for the said major at Otterbein College, she became employed at the college radio station, which at some point made her change her interests and switch to a broadcast journalism major, in which she ultimately obtained a Bachelor of Arts degree at the said institution in 1978. Chris immediately sought employment in the profession she studied for, initially landing an internship at a cable station in Columbus, Ohio, then after some time took a short-term job at the WIPS radio station in Ticonderoga, New York State. After some time, she got the position of general assignment reporter for the WNYT TV channel in Albany, New York State, quickly becoming the regular weekend anchor, and later the weekly co-anchor. She remained employed there for 17 years, after which she joined NBC News in 1998, and where she remains employed to this day, having anchored and reported for MSNBC, and having been the substitute anchor for “The Today Show”, as well as the Sunday version of “NBC Nightly News.” In between 2008 and 2010, she lived in Los Angeles, California, where she worked as a field reporter, prior to returning to her anchoring job of “Jansing and Company” on MSNBC at 10am every weekday, until the show ended on June 13th 2014. She was then named NBC’s Senior White House Correspondent, while on the 1st of June 2017, she obtained the position of MSNBC’s senior national correspondent. At the moment, she also serves as the network’s breaking news anchor, and the official White House and Capitol Hill reporter. Being 61 years, Chris has had close to 40 years of journalistic experience, and has managed to earn certain awards for her contributions to the media world. First of all, she received an Emmy for her coverage of the 1996 Olympic Park bombing during the Olympic Games in Atlanta, then received the “Best Person” award from the New York State Broadcasters Association for the report she made on hunger in New York State. Ultimately, she was inductedvinto the New York State Broadcasters Association Hall of Fame in June 2016. As for Chris’ romantic involvements, she doesn’t seem to be too keen on sharing such information with the media. Still, it is known that she dated the chemist Robert Jansing for a while before they married in 1982. The two maintained their marriage for a few years, ultimately divorcing at an unspecified date, unexplained. Her ex-husband used to run an analytical chemistry laboratory, also having worked as a research scientist at the New York State Department of Health. Chris has no children, but decided to keep her husband’s surname after the divorce. As she herself said, it is easier to pronounce than her original surname, and is thus more fitting for her profession. At the moment, it doesn’t look like Chris is dating anyone. What is Chris Jansing’s Net Worth? Have you ever wondered how rich Chris Jansing is, as of mid-2018? According to various authoritative sources, it has been estimated that the current total of Chris’ accumulated wealth is close to $8 million, largely aided by her numerous successes in the news industry, while the greatest contribution has come from her long-term presence at MSNBC. As her career continues, the said amount can be expected to increase. Concerning the physical attributes of the experienced reporter, it is said that her vital statistics are 36-28-38, her height is 5ft 6ins (1.68m), but her weight is unknown. Her body shape is generally described as fit, while her hair color is dark blond and her eyes are deep hazel. Lastly, her bra, dress and shoe sizes are unknown. Due to the major influence of social networks, it is nowadays a regular thing for active reporters to nourish a close and active relationship with their fans, for the sake of increasing the popularity of the TV networks they’re employed at, and thus their own net worth. Chris herself seems to be a regular subscriber to this celebrity trend, as she is present on most popular social media networks, save for one. Her Facebook account is currently followed by over 35,000 people, while her Twitter account boasts a significantly higher 70,000 followers, but doesn’t have an Instagram account at the moment, or it’s not accessible to the public.